I know for many people their weakness is sweets, especially when it comes time for the big Thanksgiving meal! I mean, who doesn't love pecan or pumpkin pie! Did you know pecan pie on average has over 500 calories and 27 grams of fat? Yikes is right!! I knew there has to be a middle ground, so I went researching for some healthy alternative desserts, and boy was I in luck! A great way to get the taste of pumpkin pie is to make a sweet potato pie instead! The majority of the sweetness is coming from the sweet potato instead of added refined sugar. Once you take a bite, you actually might be converted to a sweet potato pie lover instead of the classic pumpkin pie! One slice comes out to 240 calories compared to an average pumpkin pie slice with 323 calories. You might be tempted to pass over this paleo pumpkin bread recipe, but give it a chance because not only does it taste like normal moist pumpkin bread, but it is much healthier. It comes out at 156 calories per slice, which is a pretty good deal when it comes to dessert! You simply use coconut oil instead of vegetable oil or butter, and a mixture of coconut and almond flours in place of white flour. This recipe is for you ladies out there who want to be in the kitchen for the least amount of time as possible! All you have to do is chop apples, mix the other ingredients together and top the combo with oats. Put it into the oven for 25 minutes and you have yourself a delicious Thanksgiving dessert! Now, this isn't one of your typical Thanksgiving desserts, but when you add in the pumpkin, it automatically gets put into this category! Each cup is less than 100 calories and takes about 30 minutes to make from start to finish. Give this classic candy a twist with the pumpkin puree! I hope these healthy Thanksgiving dessert recipes are helpful for your family this holiday season! I know I'm looking forward to trying out the sweet potato pie to see if my boys can even tell a difference! Now, who doesn’t crave fried chicken every once in a while? Maybe you are a chicken fried steak or coconut shrimp fan? That crunch is really what we crave! Almond flour is a great alternative to your typical breading because it is literally just ground up almonds, so you are getting the same nutrients as if you were eating the nut raw. Almonds are full of monounsaturated fat, protein, fiber and Vitamin E.
Ever heard of flax meal? If you have a gluten intolerance, this is the perfect breading for you because it is a gluten-free flour alternative. You are going to get protein, fiber, calcium, omega-3 fatty acids ALA and antioxidant lignans. This ingredient is best consumed with water because it is rich in fiber, so pairing it with veggies like zucchini is a match made in heaven. Coconut flour is the perfect ingredient is you are looking to batter your meat instead of bread it. It contains magnesium, manganese, phosphorous and fatty acids, which help you feel full. It also contains five grams of fiber and two grams of protein per two tablespoons. Chicken fingers are a family favorite around my house, especially Raising Cane’s, but you can only indulge in that greasy goodness ever so often if you really want to reach your health goals. I wish it was the other way around, but we will have to live with the facts. If you want a whole lot of protein and fiber, one cup of brown rice flour contains about 11 grams of protein and seven grams of fiber. I hope these baked and better-for-you recipes are helpful with your dinner plans to help your family stay healthy while also eating the meals they love! When it comes to fall, I just love everything about it – the weather, colors and clothes. I also love fall food because somehow it tastes like the season! I grew up hating eating Brussel sprouts…just like most kids, but I have had this recent obsession with them. I think the trick is to combine them with sweet ingredients to mask their natural bitter taste. Give this recipe a try and see what your kids think – I bet they will be surprised they actually want to take another bite of a dish with icky Brussel sprouts! Make sure Brussels sprouts have trimmed ends and yellow leaves are removed. Then, slice all Brussels sprouts in half. In a medium bowl, combine halved Brussels sprouts, 2 tablespoons of olive oil, salt (to taste), and toss to combine. Place onto a foil-lined baking sheet, cut-side down, and roast in the oven at 400 F for about 20-25 minutes. During the last 5-10 minutes of roasting, turn them over for even browning, the cut sides should be nicely and partially charred but not blackened. In a medium bowl, combine cubed butternut squash (peeled and seeded), 1 tablespoon of olive oil, maple syrup and cinnamon. Then toss to mix. Note: You can roast both Brussels sprouts and butternut squash on two separate baking sheets at the same time, on the same rack in the oven – that’s what I did. If you want a full body transformation, CORE DE FORCE will get you into knockout shape. This is a 30-day total body transformation program that includes mixed martial arts-style training. Joel Freeman and Jericho McMatthews, the co-founders of CORE DE FORCE, spent 18 months preparing the workouts and nutrition plan, so you know it has been refined to its highest potential. You might be thinking: I have no experience with MMA or boxing, how the heck am I supposed to be able to do these workouts? I thought the exact same thing until I heard Joel Freeman tell us his answer. Everyone can work at their own pace with CORE DE FORCE, so it doesn’t matter if you’ve never boxed before. You can start where you are comfortable. There is a modifier on every workout, so you can decide for yourself what you are capable of doing. Because there is no pre-requisite needed, you just push play and go. You will be engaging your core and making your body do something its never done before. And your body will respond appropriately by giving you real results. Your body will show you muscles you never knew were there, and you will surprise yourself with what you can do. Now, this is not a weight loss program. This is a total body transformation program. That doesn’t mean weight loss isn’t included, but you will be working on physical strength and mental change along with it. You are spiking your heart rate to burn the calories and shed the fat. No equipment is needed because with CORE DE FORCE, your body is your resistance. The co-founders of CORE DE FORCE wanted to make the nutrition plan as SIMPLE as possible. So Joel said, “This is an eating plan, not a diet plan.” FOOD is GOOD. So they encourage you to eat and eat enough. Because this is a higher intensity program, you get to eat more food than usual nutrition plans. There are recipes that you would even eat if you weren’t on a workout regimen. Who likes burgers and pizza? Well, you hit the jackpot. You get to transform your body and eat burgers and pizza? YES! There is a BBQ chicken pizza recipe along with a Kobe beef burger to get you that protein. At the beginning of the program, you will figure out your caloric intake needs with a chart they provide on page one. Then you will use the color-coding system from the 21 Day Fix containers to match those caloric needs. Researchers found that 2 billion people worldwide are now overweight or obese. So, this is a serious matter! We want to help you become the best version of yourself. And sometimes that means hard work, discipline and patience. Give yourself 30-days for total body transform, and we will get you there! CORE DE FORCE releases Monday, October 31, so you can kick off in November! Send me an email by clicking the button below if you are interested in giving it a try. Looking forward to working with you! You can get so creative with some of your old recipes when it is Halloween! For example, check out my blog post about Healthy Halloween Snacks. There are some spooky ideas 👻 you might want to try…but don’t worry, they are still healthy and delicious. So instead of baking your typical stuffed peppers, make them little Jack-O-Lantern peppers! All you have to do is cut out the inside of the pepper then cut out the eyes, nose and mouth just like a normal pumpkin Jack-O-Lantern. Thankfully, peppers are WAY easier to cut through so you don’t have to break a sweat in the kitchen. Hope you enjoy the process and the end product! Heat oven to 400°F. Lightly spray olive oil spray in a medium nonstick skillet and heat on a medium heat. Add 1/4 cup of tomato sauce and 1/2 cup of chicken broth, mix well and simmer on low for about 5 minutes. Combine cooked rice and meat together. Cut the bell peppers in half lengthwise, and remove all seeds. Make your Jack-O-Lantern face - Get as creative as you wish! Spoon 2/3 cup meat mixture into each pepper half and place in a 9 x 13-inch baking dish. Top each with 1 tbsp cheese. Pour the remainder of the chicken broth on the bottom of the pan. Cover tight with aluminum foil and bake for about 45 minutes. Carefully remove the foil and serve right away. Recipe from the skinnytaste blog. Sometimes I look around my house and think "How the heck did all of this clutter get here?" I mean, some of this stuff I don't even know where it came from! And then there are those essential items like your Wi-Fi router that are just plain ugly. Who wants to look at that thing! So I was researching creative ways to hide them, and I came across the idea of hiding your junk with fake books! What a brilliant idea...truly. All you have to do is collect some old hardcover books and cut the inside pages out. You can get old books from garage sales, thrift stores or recycled book stores. You might even have some lying around the house. If you don’t have any books, you can always cover some cardboard with cute fabric. You would never know the difference! First, you cut out the inside pages of the books so you are left with just the shell. Use an exacto knife so your cut is "exact" haha, unless the book is SUPER old and the pages just fall out on their own. Second, find a crate or box that can hold all of your junk. It doesn’t matter what it looks like because it will be completely hidden. Measure out how many book covers you need to cover the whole crate. Third, cut off the front and back of the book covers with the exacto knife. Make sure to leave the front or back of two of the books because those will be on the side of your crate. Lastly, hot glue those puppies together, and your project is complete! Now go hide that junk that has been laying around for who knows how long. We love dressing up for Halloween, so why not dress up your favorite healthy snacks in costume too?! Forget the sugary candy corn and caramel apples. These little treats are decked out in costume, which makes them super ADORABLE, but they are also way better for you than your typical Halloween treats. Wrap up your apples in gauze tape, add some candy eyes, and viola, you have a genuine mummified apple ready to be devoured! Get a scare out of your kids by making some banana ghosts with chocolate covered raisins! If you’re bringing this to a party, peel a few clementine oranges and use a sprig of celery for the stem to make a miniature pumpkin patch. Nix the boring veggie tray when Halloween comes around. Organize some carrots, black olives and broccoli to make a Jack-O-Lantern! Then put your yummy green veggies on a separate plate and make a Frankenstein. Give your kids the reigns on this one and see what they come up with! Turn your oranges into mini Jack-O-Lanterns by cutting off the top, scooping out the middle and carving a face on the side. Then just fill them with your favorite berries! This is such an easy craft that makes lunchtime so much fun! If your kids like hard boiled eggs in their lunch box, sneak one of these decorated ones in there and see if you can give them a scare. Then, when they get home, let them decorate the rest of the eggs! 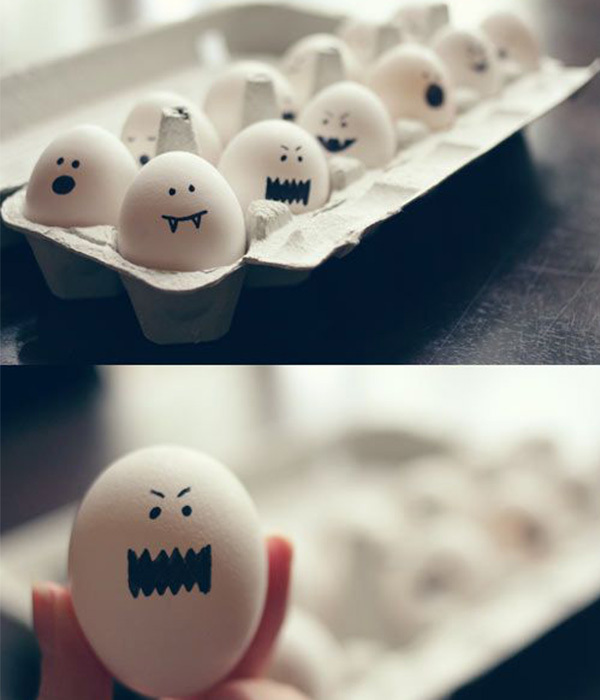 Check out the Beachbody Blog for more Halloween treat ideas! It's now Pumpkin Spice Latte season, but who said pumpkin flavored things have to stop there?! We can use this wonderful veggie in SO MANY different recipes from breakfasts to soups and desserts. Check out some of these creative pumpkin-inspired recipe ideas! Combine oats and milk in a small saucepan over medium heat. Bring to a boil; reduce heat and simmer, stirring occasionally, until desired consistency is reached, about 3-5 minutes. Stir in pumpkin, vanilla, cinnamon and nutmeg until heated through, about 1 minute. Serve immediately, garnished with pecans and maple syrup, if desired. Add the butter to a medium sauté pan set over medium-low heat. Once the butter has melted, add the onions, garlic and curry powder and cook, stirring occasionally, until the onions are translucent. Transfer the mixture to a blender. Add the pumpkin purée and chicken stock to the blender and blend until combined. Pour the soup into a large stock pot set over medium heat then whisk in the coconut milk. Cook the soup, stirring occasionally, until it is warmed throughout. Taste and season it with salt and pepper. When ready to serve, divide the soup into bowls and garnish with sour cream and chopped pumpkin seeds. Preheat the oven to 350°F and then grease or line a muffin tin for 12 muffins. Starting with the wet ingredients first (pumpkin, maple syrup, eggs, etc.) layer everything except the chocolate chips into a blender or a food processor and blend for about 30 seconds, or until smooth. Using a spoon, gently stir the chocolate chips into the batter. Pour the batter into the muffin tin, filling each about 3/4th of the way full. Bake in the oven for 22 minutes, until light golden brown. Allow to cool for at least 10-15 minutes before stuffing in your face. I hope you enjoy these fall pumpkin recipes! If you try any of them, I would love to hear back on your thoughts. Just send me an email by clicking the button below. Hope you have a great week! Waffles just got back on my recipe list!! Most of the time, waffles are made from the exact same ingredients as pancakes, just with more butter, which means they are a no go. Well, I found a waffle recipe that will blow your mind because it still has the crunch we know and love, and it is WAY better for you than what you’re probably used to. Say hello to whole wheat waffles! Now, instead of pouring a helping of maple syrup on top of your waffle, sweeten it with some fresh fruit instead! Maybe even try some peanut butter or Greek yogurt. Another trick is to make a simple fruit sauce by heating berries in a pan coated with nonstick spray for 2–3 minutes. If your kids are big Eggo fans, these will be the perfect replacement. For freezing these babies, just arrange the waffles in a single layer on abaking sheet lined with parchment paper (once they’ve cooled). Freeze them for two hours and transfer them to a freezer-safe bag. Then treat them the same as your classic Eggo. Pop one or two in the toaster until they are the right amount of crisp! 1. Combine flours, baking powder, flax seed, and salt in a medium bowl; mix well. Set aside. 2. Combine eggs, almond milk, maple syrup, and oil in a large bowl; mix well. Add flour mixture. Mix until blended. 3. Pour ¾ cup of batter at a time onto hot waffle iron, lightly coated with spray. Cook waffles until golden brown and crisp. 4. One serving equals one waffle; leftover waffles can be wrapped up and frozen. Recipe from the Team Beachbody Blog. 3 Week Yoga Retreat - At Home! When you saw the word yoga, you were probably like "No way José!" because it can be intimidating, right? Well, I'm not so bendy or flexible either, and I can easily complete these workouts! Yoga has so many benefits for the body, and it is a great way to get back into working out because it is easy on your joints. You don't have to know any complicated poses or be abe to stand on your head! If you have a yoga mat, you are ready to go. This 3 Week Yoga Retreat makes the moves easy to understand and was designed so you can easily follow along. Each day focuses on a different area of improvement. For example, Mondays focus on your core, Tuesdays are full of stretching, and Wednesdays are for balance. Signing up is as easy as clicking a button, which is provided below, but I highly recommend you watch the video! As always, if you have any questions, feel free to send me an email!